Between the stress from work, the weather, and the pressure one often feels around the holidays, a bit of relaxation is more valuable than ever. Here are a few unique indulgences available locally that can provide an oasis of calm and healthy-well being. With the Power Plate – exercise is a cinch! Nicely defined muscles and a slim body – that’s everyone’s dream. But the road to this goal is long, and requires hours in the weight room and dozens of sweaty T-shirts. But today chronically busy people have another alternative for looking and feeling great without lifting weights. How? 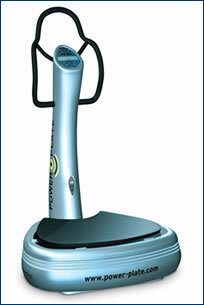 By using Power Plate technology, which was introduced into the Czech Republic by the Holmes Place fitness chain. The revolutionary nature of Power Plate lies in the fact that a training session takes ten minutes but equals 1.5 hours of training. Furthermore, you barely perspire, so you don’t have to change clothes. Power Plate operates on the basis of involuntary physical reflexes evoked by special vibrations that act on a large number of muscle fibers that can’t be affected during ordinary training. These stimuli produce stretching reflexes that result in intensive contraction of muscle fibers. This allows easy, safe, and highly effective training focused on strengthening and stretching. My personal impression? Great. Even a couch potato can learn this, even though the first three sessions require an instructor to teach you the right exercises. It isn’t difficult, you just alternate various positions and let the pleasant vibrations work on you. It even seems like nothing much is happening. “But that’s a mistake,” says Jan Hnilička, the manager of, and instructor in, the Holmes Place weight room. “You’ll see tomorrow,” he laughs, adding by way of explanation that long-term Power Plate use indisputably increases muscle strength, helps with rehabilitation and osteoporosis, breaks up cellulite, and improves blood circulation. Power Plate has received four prestigious awards in the area of anti-aging and wellness, and has found its way into the health regimens of celebrities like Karl Lagerfeld and Annie Lennox. Those who can’t stand saunas and steam finally have an alternative – something in between. It’s called Stonebath, a unique steam bath where steam is generated by means of lava stones heated to 650°C and placed in a steam bath. The temperature in the room, which is permeated by aromatic essences, never exceeds 56°C. Where can you try it? 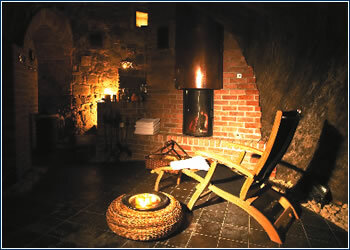 In a 15th-century cave that was accidentally discovered by workers during the reconstruction of the Prague hotel Hoffmeister. Stone vaults, subdued lighting, a fireplace, and beds that beg you to relax. This is an enticement to cancel your next appointment and stay as long as possible. Especially when you know that the steam bath is an ideal introduction for the massage and beauty treatment. Besides classic and Chinese massages, Richard Haken will also offer you moxa, an herbal stick that is widely used in Chinese medicine. It looks a little like a cigar, but when burned and applied to various acupressure points, it relaxes the organism. “Moxa use is a somewhat mythical experience,” claims Haken, adding that according to an ancient saying, when needles won’t help moxa will. By way of explanation – it doesn’t hurt, because this wormwood stick is applied a few centimeters from the surface of the body and client states what is pleasant and what isn’t. And for a glowing appearance in a few minutes, go for immediate skin rejuvenation with Sisley cosmetics, which the Lily wellness facility in the hotel Hoffmeister uses exclusively. In 30 minutes, cosmetician Eva Plicková will do what would take a traditional treatment an hour. The cleaning, toning, exfoliation, calming, intensive care, express massage, express masque, moisturizing, and the final treatment are super-fast, thanks to intensive Sisley products that are rich in minerals and vitamins. A hard day, if you’re looking forward to cascading water gradually washing away your tension and stress, go to the hotel Le Palais in Vinohrady and take an aromatic shower. The Relax and Wellness there offers two variants. One has water enriched with essential oil of lemon or passion flower. Suddenly you find yourself in a yellow geyser that stimulates your senses and “awakens” your body, which hungrily absorbs the oils through every pore. In the other variant, you’ll feel like you’re in a dream – the water doesn’t cascade down, it sprinkles slowly and gently like a summer shower. The blue vapor and enticing aroma are due to menthol or mint. You won’t want to leave, and perhaps you’ll jump from one shower to the other until you’ve had enough of this unusual attraction, which perfumes you with 100% natural oils that don’t contain any chemicals. You don’t use soap in an aromatic shower – your skin not only cleans itself, it “impregnates” itself, so there’s no need to apply any body milk after you bathe either. “People leave us so exhilarated and relaxed,” says Kamil Trmal, the manager of the Relax and Wellness Centrum, adding that an aromatic shower is ideal after exercise, a sauna, or a steam bath in the center, which also offers relaxation therapy with lava stones. These deep volcanic rocks, which Hotel Le Palais gets from far-away Indonesia, are heated to 50°C, and during a relaxing Hawaiian massage they provide wholesome heat and minerals. Try it! You won’t regret it. Personalities like Prince Albert of Monaco and model Adriana Sklenaříková already swear by it. Just imagine voluntarily crawling into a room where it’s -150°C! This therapeutic cure called cryotherapy has an amazing effect on your body and soul: it improves the effectiveness of your immune system, increases the concentration of many hormones (gentlemen may find that their sexual appetite rises), has a positive effect on your psyche, improves your endurance and the resistance of your nervous system to fatigue and stress, and accelerates your metabolism and the flushing of harmful substances. It helps with inflammatory ailments of the motor system and rheumatic diseases of soft tissues. But that’s just a fraction of the list of miracles that the “polarium” offers. How exactly does it work? After you place your order and a doctor examines you you are issued clogs, knee socks, cotton gym shorts, gloves, a headband, and a face mask. Women also get a light T-shirt. And into the frost. Step quickly into the chamber and close the door. You are staggered by the -60°C temperature. Walk slowly in a circle without breathing a word. After a minute you’re directed into another little room where it’s a shocking -150°C. Fear not – so far everyone has been able to stand it, and many come back for more. Your core body temperature doesn’t change much, and only the surface of your body is cooled and active hyperaemia lasts a few hours during which you feel almost no pain. There is only one Polárium in the Czech Republic for frost treatment. It’s in the heart of Beskydy, in the village of Čeladná, which offers a sought-after golf and riding complex as well as the “ice house” and other rehabilitation procedures.